detail in the following paragraphs of this chapter. Of course, the preceding calculations are based on highly simplified conditions but they do give a fair indication of the general order of the time intervals, accelerations, and forccs which can be expected in a high-rate-of-fire multiple chamber gun. Although the analysis is primarily concerned with the movement of the chambers, it can be seen readily that the entire design problem will be similarly affected by the extremely short time available for each weapon function. In order to obtain smooth highspeed operation, every function must be timed with great precision. Ignition of the propellant charge must occur at exactly the correct instant, unlocking must be neither premature nor late, the application of the force which moves the chambers must take placc at the instant the unlocking action is completed, and locking must occur just as the loaded chamber reaches the firing position. Even a slight delay at any of these critical points can seriously cut into the time available for the remainder of the operation. 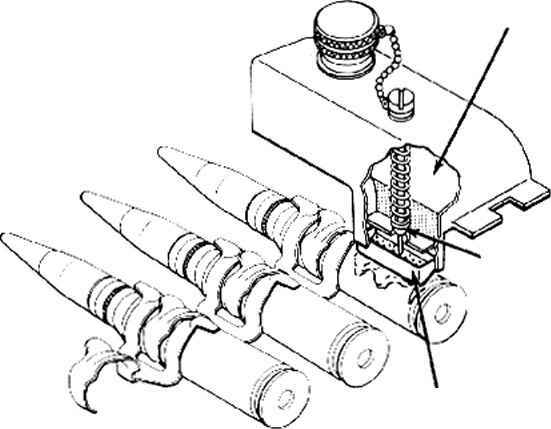 A similar necessity for precise timing and extremely rapid action exists in all phases of the operation of a high-rate-of-fire multiplc-chambcr gun. The loading operation, the ejection of spent cartridge cases, and the conditions of recoil are all subject to the same stringent requirements. In fact, it has been facetiously remarked that the designer of these weapons is an unfortunate individual who is continuously snatching at the coat-tails of the fleeting and infinitesimal instant.